In yet another sign that this year's holiday season will be fought hard in the toy aisles, both Walmart Stores (WMT) and Toys "R" Us announced expanded promotions for holiday shopping. Walmart will cut prices on another hundred toys, including more additions to its 100-toys-under-$10 lineup. It cut the prices of popular board games like Candyland and Yahtzee to $5, and marked down popular toys, including the Bakugan starter pack (now $8) and Star Wars light-sabre (now $15). The retailer also announced it will offer free shipping on all online toy orders picked up in-store, including bikes and scooters. Toys "R" Us chain Babies "R" Us will offer a holiday sale until just before Thanksgiving, to mark the opening of the pop-up Toys "R" Us Holiday Express shops. Discounts include a $10 gift card with each $75 toy purchase, and discounts and gifts with purchases on items by Crayola, Fisher-Price, and other brands. The 260 pop-up shops in Babies "R" Us stores -- plus another 80 standalone stores in shopping malls -- are fronts in this year's hard fight toy-retail war. Wal-Mart got out of the gate early with the $10 toy program in September, and expanded it after rivals including Target Corp. (TGT) matched its prices. 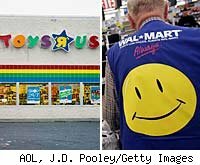 Toys "R" Us has ceded part of that fight, focusing instead on exclusive items and services. The chain also brought back layaway on some items, and trade-ins for old video games. Last month it opened FAO Schwarz shops within stores, carrying a small selection of exclusive toys from the fabled New York toy store. The Toys "R" Us strategy may end up being a wise longterm plan. Walmart and Target can use the toys as a loss leader to drive traffic to other departments, but Toys "R" doesn't have such room to maneuver. Still, some experts warn that Walmart's price cuts may go too far and could bite back, both long- and short-term. On the plus side, all these discounts come early in the holiday season, which experts call a trend this year. Retailers are putting out generous offers early, to encourage shoppers to start their holiday shopping before Thanksgiving, and to get the word out that inventories are thinner this year. There have even been some questions about merchandise shortages -- but with no hot toys this year, that's not expected. When October retail sales figures come out tomorrow, we'll know if the early-sales strategy has had an effect. Reuters reports that figures are expected to show momentum building towards the holiday but warned that recovery is still iffy. The real test will come after Black Friday -- the day after Thanksgiving, and the traditional start of the holiday shopping season. If we still see big discounts in toys as we go into December, brace yourselves for a harsh holiday in Toyland.